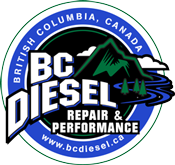 Located in British Columbia, Canada, BC Diesel Truck Repair & Performance has deep roots in the North American diesel truck industry. Myself, Dave Dias, with my business partner and wife, Christie, have over 30 years of experience combined within the light duty diesel truck industry. We specialize in diesel truck maintenance, diagnostic, repair, diesel engine emissions and drive-line upgrades. BC Diesel is a family operated business with a dedication to customer service and building long-lasting relationships. Our business model will always remain simple... "Customer Service"
BC Diesel specializes in diagnostic, repair and performance of light duty diesel equipped trucks, primarily but not limited to Dodge Cummins, Ford Powerstroke and GM Duramax diesel equipped trucks. We offer general maintenance and repair services with monthly specials and detailed vehicle history records. With specialized training, the latest diagnostic tools and years of experience BC Diesel has what it takes to get our customers diesel truck working reliably again. Whether a work-horse or fleet truck, daily driver or seasonal recreational tow rig, BC Diesel will get you back on the road quickly, inexpensively and more reliably! If more reliable diesel parts or higher performance diesel modification are what the customer is after than BC Diesel truck is their one stop shop. With over 20 years experience in the Diesel Performance industry, owner Dave Dias not only has the know-how to recommend the right product for your particular application, he understands the products and knows how to support them!